Things have continued to fall apart with the Nollywood upcoming actress of the Yoruba genre, Ms Tayo Odueke (Sikiratu Sindodo) who many movie watchers have described as a woman with no shame and who can do anything in the name of money without any modicum of dignity. Huhuonline.com was hinted that since Tayo (University of Lagos graduate) broke away with her former lover who is simply known and addressed as MC Oluomo, an Oshodi 'king' of National Union of Road Transport Workers (NURTW), all has appeared not to be well with her. Another source revealed that the fallout between her and this garage tout was not unconnected with stealing of his expensive gold chain and also her high level of promiscuity which she even extended to one of Oluomo's personal aide at the garage, this ultimately led to the withdrawal of Tayo's Murano Jeep by Oluomo, and was equally kept at arms length. As if that was not enough for Tayo she was arrested and detained at the police State Traffic Division (STD), of Obafemi Awolowo Way, Ikeja over manslaughter. Sikiratu as fondly called by her fans was apprehended last Friday (18th Dec) at Muri Busari Close, Oloti Village, Off Adeniyi Jones in Ikeja, where she was accused of having crushed a 16-month old boy, who is identified as Damilola, to death with her Red Honda CR-V with registration number FE 589 LND. Although there are conflicting reports of how the tragedy occurred. While some witnesses claimed that she crushed the toddler from the rear, others claimed that the toddler ran into the vehicle while the actress was driving out of the close. It was again gathered that Sindodo had driven into the neighborhood that day to visit her friend, Tope Doherty, who had just returned from London where she is based. They were said to have spent sometime together before they decided to go out. Trouble started when Sindodo was halted and told to come down and see the little boy she had killed. The crowd in the neighborhood raised an alarm that the actress had crushed the toddler while negotiating her way out of the close. Also another eyewitness said the toddler ran into the actress' jeep from her mother's relaxation centre and in the process, was hit by the vehicle. She said the actress was not even aware of the situation, as they had to run after the vehicle and call her attention to the tragedy caused by her through mistakes. A source also claimed that the actress was initially unaware of the toddler's death. He stated that the actress crushed the 16-month old boy while trying to reverse her vehicle out of the close. Consequently the matter was reported at the Nigeria Police, State Traffic Division (STD), 'B' OPS Department, Ikeja and Sindodo was immediately arrested and detained. Her vehicle was also impounded. She's still being detained for further interrogation by the men of the Police Force of the Ikeja Division. Huhuonline.com has it that the residence of the parents of the dead boy, relations and sympathizers lamented the tragedy, while the parents were said to have gone to a relation's place. The boy's corpse was buried at the weekend. Police has also confirmed that following appeals from several quarters, the parents of the deceased have decided not to press charges against Sindodo. To be on the safe side, it was learnt, the Police have directed the father of the late toddler to swear to an affidavit that the family is not interested in pressing a manslaughter charge against the actress. 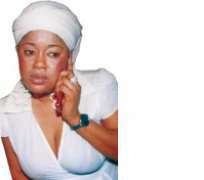 Nollywood source confirmed to huhuonline.com that she had lost weight and her eyes swollen as a result of constant and uncontrollable weeping over her predicament. It was also discovered that shock was still written all over her as she was incoherent in her utterances. Indications have also shown that Tayo (Sikiratu Sindodo) has been trying to engage her lawyers in this present predicaments she found herself so that her bail can be secured before Christmas day, December 25, as the bereaved has declined to make any legal action against actress.